Just when UCLA was becoming known as a donut team — nothing in the middle — Tony Parker comes off the bench and lives up to his recruiting hype. Tony has had a few good games in his season and a third as a Bruin, sometimes showing flashes of why he was a McDonald’s All-American, but in general, he has been inconsistent, unable to sustain any momentum from game to game. And he has rarely been a factor against a good team with the game on the line, until Saturday night against the Crimson Tide. 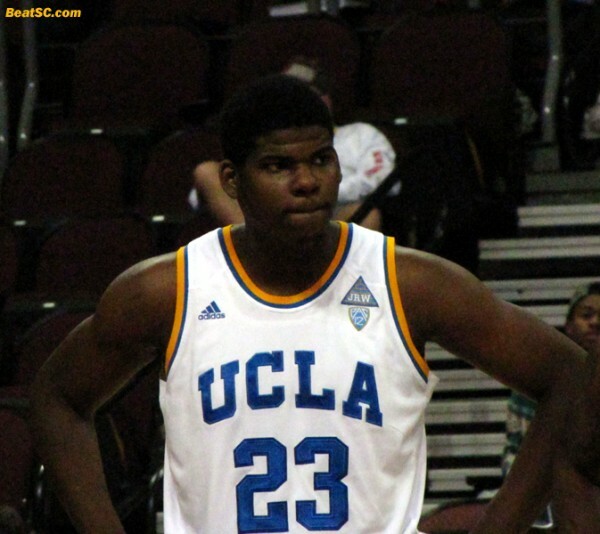 Last night, Parker was undoubtedly the Player of the Game for UCLA. Alabama fought valiantly after a slow start, coming back from 11 down to take a 1-point lead at the Half, behind a superb performance by Trevor Releford, who ended up with 34 Points. It was still tied with about 15 minutes to go in the game when Parker and the Bruins finally started to gel. UCLA built a 9-point lead with just over 6 minutes to go, with Parker leading the way, on his way to a 16-Point, 5-Rebound, 2-Block night. But the Tide was relentless, tying the game at 67 with a minute and a half to go. That’s when Parker got a Rebound, got fouled, and despite being a 44% Free Throw Shooter, SANK BOTH FREE THROWS, then got the next Rebound, and then Blocked Bama’s next shot. Those two Parker Free Throws and subsequent clutch plays in the Key started an 8-0 Bruin spurt that closed out the game, as UCLA triumphed 75-67. Travis Wear (10 pts), Norman Powell (13), Jordan Adams (14), and Kyle Anderson (13) all scored in double-figures, with Adams grabbing 9 Boards, and Anderson dishing out 7 Assists, but Adams and Anderson each missed more shots than they made, and they had 7 Turnovers between them. But Parker was 6-for-7 from the floor, and 4-for-5 from the Line, making him the most consistent and valuable player on the floor not named Releford. When you add in individual EXPECTATIONS, Parker was clearly the Top Story of the Night, as Adams almost always leads the team in scoring and Anderson almost always flirts with Triple-Doubles. But Parker has tended to disappear, and even lost his starting spot after Travis Wear recuperated from his Appendix Surgery. Parker showed talented Offensive moves that would — IF he can repeat them on a regular basis — earn him his starting job back. With Pac-12 Conference play starting next up, it is a perfect time for Parker to blossom. Bruin fans will have to hope that Paker can continue his improvement against teams that — unlike Alabama — have decent big men. Those fans will find out quickly, and you better watch out, you better not cry, you better not pout, I’m telling you why — u$c is coming to town. 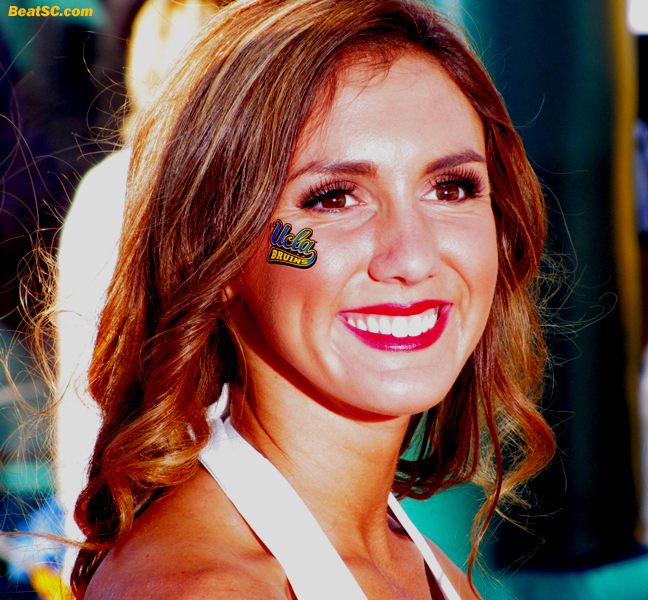 Speaking of Xmas, here are 30 presents for you — 30 photos of the UCLA Cheerleaders, from the Cal Football game earlier this year. 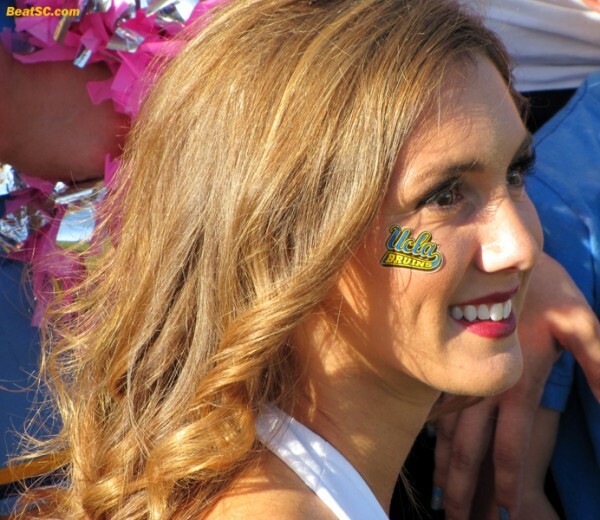 "TONY TURNS THE TIDE" was published on December 29th, 2013 and is listed in Blue & Gold News, UCLA/usc/Cheerleader Photos, UCLA/usc/Sports Photos. Very nice that they were able to sink 8 consecutive clutch free throws…but that said being, they looked AWFUL almost the entire rest of the game. They had a huge talent and size advantage over Alabama, yet they blew 10 point leads by being sloppy, and getting outhustled, and outmuscled–how weak-handed are these guys who can get their hands on a rebound but can’t hold onto the damn ball long enough to get into transition? But they’re not only failing to rebound with authority, they’re failing to FINISH with authority–not just their drives but their games. And one of the reasons is a glaring lack of senior leadership from the Wears–with even slight improvement from last year they should be dominating this year, yet they’re tentative and weak. Enough about the appendix–time for Travis to nut up and start leading this team, instead of just going through the motions. In fact, it’s time for this whole team to start playing with the energy and aggressiveness (on both ends of the floor, for 40 minutes, not just in spurts) that breed the dominance that leads to the air of superiority that is rightfully theirs to possess–just by virtue of wearing those four letters, playing for a 12th banner. 2013, and the preseason, is over–it’s winning time. Now. I really don’t like to dwell on the times we did not get it done but does anyone know how many times we’ve finished in 2nd place [for an NCAA Championship, across ALL Sports]? Just curious.